Yemen's exiled President Abd-Rabbu Mansour Hadi says his forces are battling Shiite Houthi rebels across the country to stop Iran. Yemen's exiled President Abd-Rabbu Mansour Hadi said on Saturday that his forces were battling Shiite Houthi rebels across the country to check "Iranian expansion" in the region. Hadi was speaking as he made a short visit to Sudan, which was seen as being close to Iran before it joined a Saudi-led coalition against the Yemeni rebels in April. "We are currently leading a war based on stopping Iranian expansion in the region," Hadi said at a press conference with his Sudanese counterpart Omar al-Bashir, according to the AFP news agency. 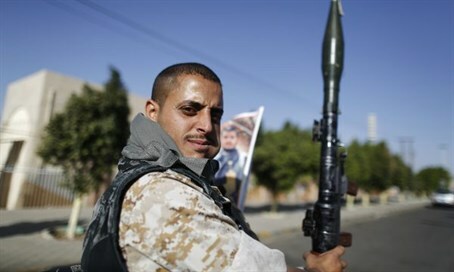 His comments came as coalition warplanes launched strikes against the Iranian-backed rebel positions in Yemen and reinforcements reached pro-government troops preparing for an anticipated push towards the capital Sanaa, military sources reported. Hadi said rebel forces had been pushed back in recent weeks. "Now there are few provinces where battles are still going on. There is fighting in Taez, and Ibb and Hodeida and Marib," he said. He arrived in Sudan on Saturday afternoon to meet Bashir for talks. Sudan had previously been seen as close to Iran, whose warships used to make stops in Sudanese ports. But last September, Sudan shut Iran's cultural center in Khartoum andjoined the coalition against the Houthis in March. With air support from their coalition allies and freshly trained troops, supporters of the exiled president had pushed the rebels from the second city of Aden and four other southern provinces and are fighting to control the third city of Taez. In March, Houthi rebels and troops loyal to former president Ali Abdullah Saleh advanced on Aden, where Hadi had taken refuge after escaping house arrest in Sanaa. Hadi later fled to Riyadh, which assembled an Arab coalition that mounted a fierce air campaign against the rebels. At Saturday’s press conference, Bashir also promised to give assistance to Yemenis studying in the capital and that Sudanese doctors were in Aden treating civilians wounded in the conflict.